I found out that a 'book launch' actually just means sitting around waiting for the phone to ring with requests for press interviews. Far from being a glitzy affair (friends have been asking if they should start waxing their legs yet), I could just as well have been sitting here in my PJs doing the interviews. Actually, I was in my PJs this morning for a 5:15 am live radio interview on ABC's Overnights. I wonder if any one was interested in the topic at that hour of the morning. Andrew says plenty of new parents up at that hour...but as I remember listening to the radio was never high on the agenda in those days. Press people have been very supportive of the book, and I had a lovely review by a great-grandmother in an e-magazine for seniors, Bonzer! I did however have a 'stuck' moment when ABC Canberra did a live interview focusing on the nappy 'debate', and a caller rang in to say her children had had terrible nappy rash which had only been kept in check by disposable nappies. I tried to get across the message - which I really hope comes across in the book - that the important thing is to start thinking about your and your family's consumption impact. Not what nappies you use! But radio is a difficult medium. The person who gets the last word really gets the last word! Heartiest congratulations, Debbie. I'm hoping ABC will ship me one to New York. The nice title surely attracts mothers all over the world. 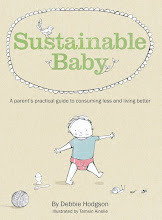 I'll get this book and recommend it not only to parents but also to all people who want to tighten the purse strings.